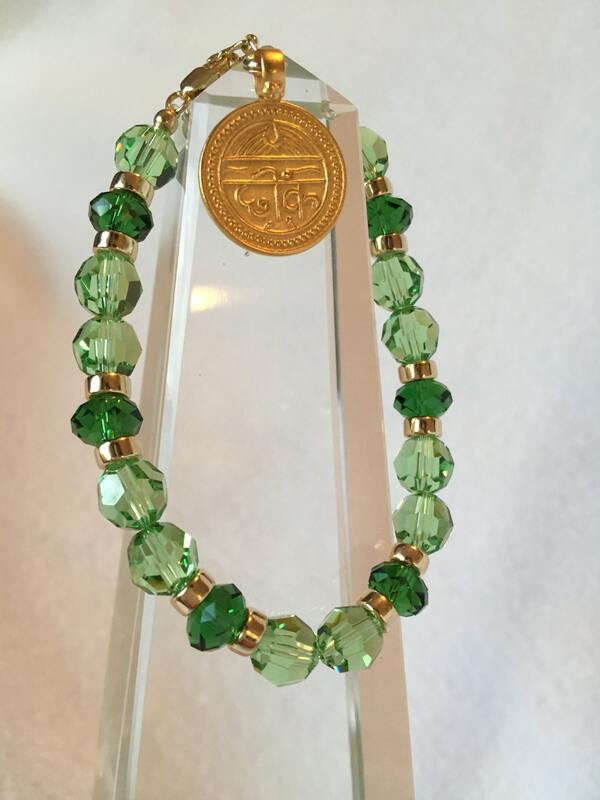 COLOR: Peridot and Dark Moss Green Swarovski Crystals - Sterling Silver or 14K Gold-Filled (Your Choice.) Sanskrit "Good Health" charm is sterling (silver) or gold vermeil* (gold). These Swarovski crystals have been energetically cleared and infused with sacred energy to become a direct link to the Divine so that you will continuously receive all the HEALING ENERGIES that you are ready for, and exactly what YOU need. We have unlimited capacities for healing our bodies and our being. These blessings will assist you in allowing and experiencing all that is possible for you, physically, emotionally, spiritually and mentally. The energy of the blessings of health and healing will help you to be connected to the thoughts, feelings and emotions that create pain, dis-ease and illness. It will help you to allow the body to heal and be healed. We can receive as much healing as we will allow. Wearing these crystals will assist you in releasing the belief that our bodies must age. Aging is a process that we have discovered does not have to be so. These jewels will assist you in your beliefs and the possibilities for creating your own fountain of youth. WHAT OTHERS ARE SAYING: "I put this bracelet on, and realized at the end of the day my knee didn't hurt, even though I had been on my feet all day!"